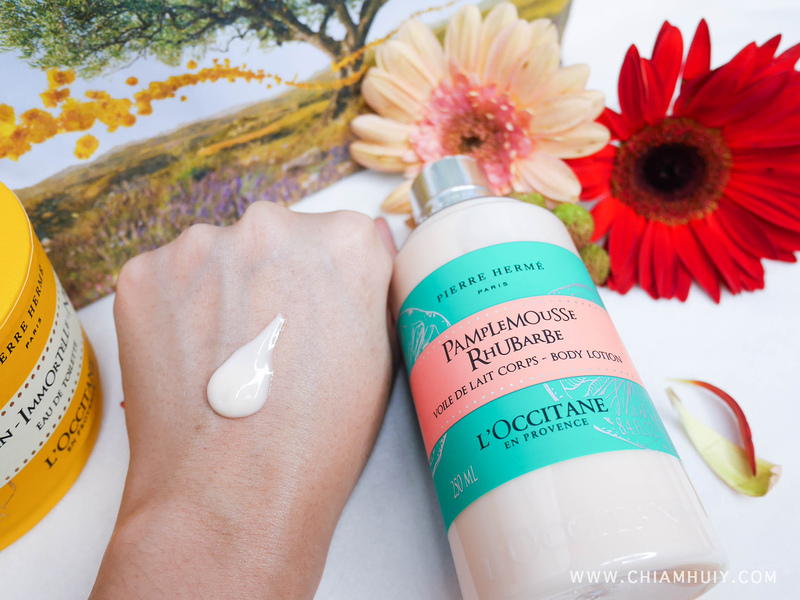 Ever since my dear girl Kymm recommended me Loccitane's lip balm, I started following this brand closely because their products are terrific! 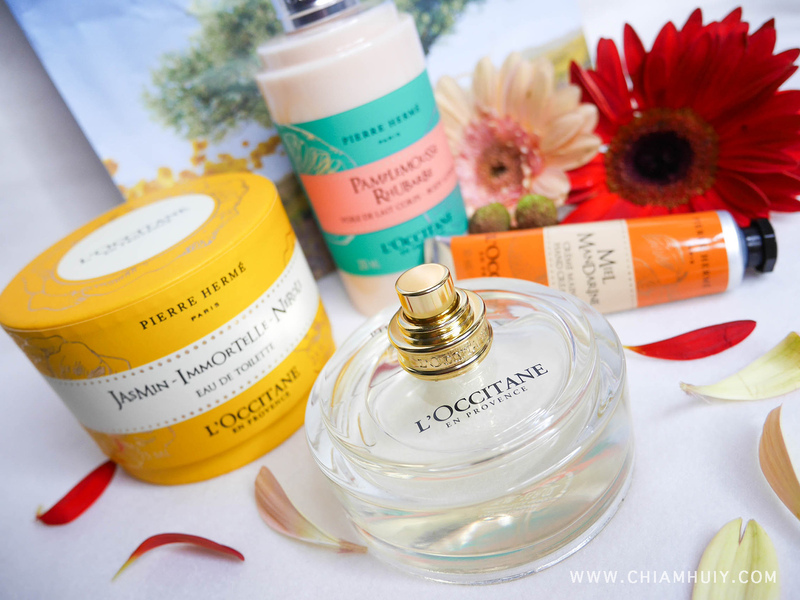 My impression of Loccitane is mostly about floras and plants, especially its iconic Lavender element. 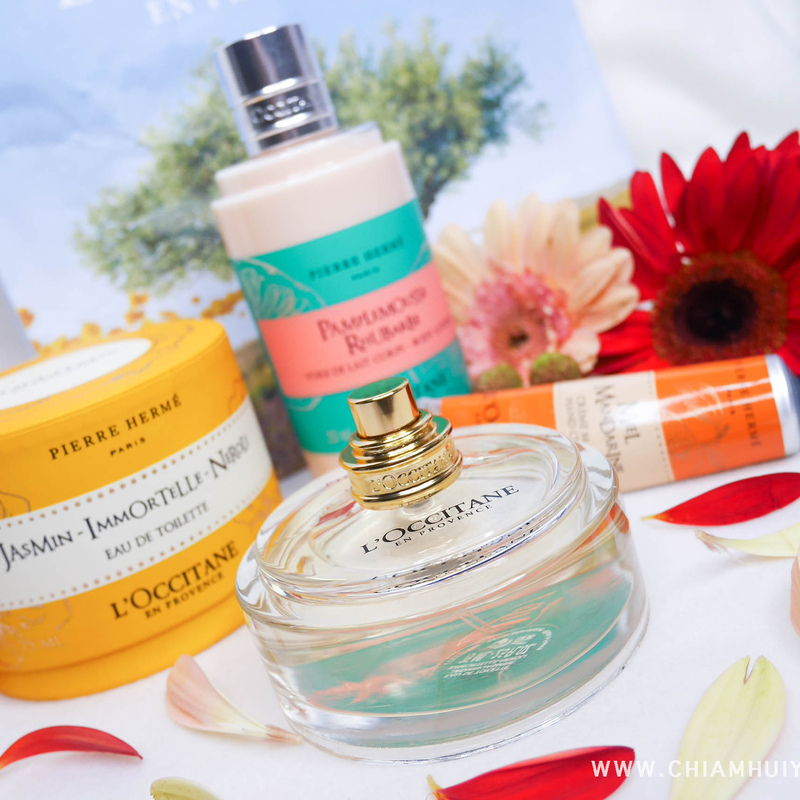 This season, Loccitane sets out to bring you a fusion of exciting pleasant flavors and scents in its new L’OCCITANE x Pierre Herme collection. I am telling you I fell in love with the scents immediately after the first time I use them! Through a collaboration with renowned pastry chef Pierre Herme, Loccitane features 3 differently scented collections like the Jasmin Immortelle Neroli, Pamplemousse Rhubarbe and Miel Mandarine. 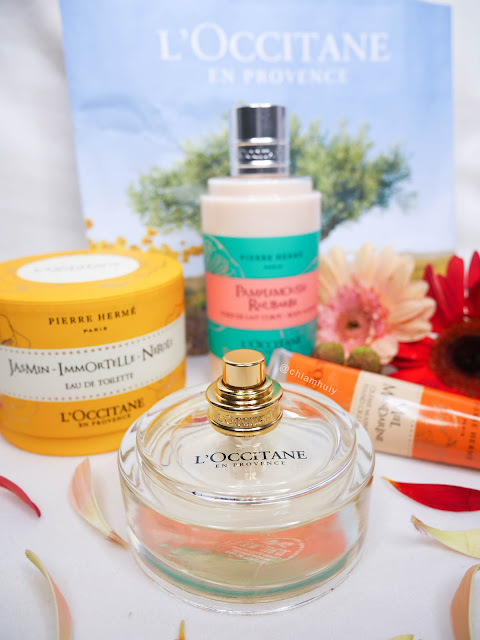 For Jasmin Immortelle Neroli and Pamplemousse Rhubarbe (Grapefruit), these two ranges bring you 6 scented products namely Eau De Toilette ($103), Shower Gel ($33), Silky Body Lotion ($48), Perfumed Soap ($8), Hand Cream ($15) and lip balm ($16). 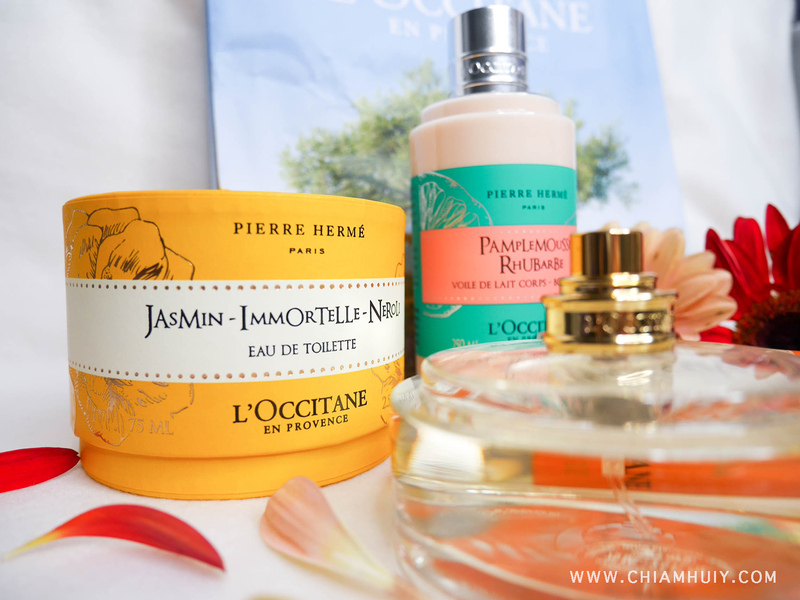 During days where I feel like smelling more refreshing instead of an overdose of sweet scent, I would definitely opt for this Jasmin Immortelle Neroli Eau De Toilette. The top notes cover Petit grain, Pink pepper and Lemon, middle notes mainly composed of Jasmine, Immortelle, Neroli and Orange blossom with finally Amber, White wood and Musk take over as the base notes. I love the refreshing scent thanks to elements of lemon, mostly jamsine before it finally settles down to a toned down musky scent. The overall scent is amazing, it's not overwhelming and it's so refreshing. And because this is Eau De Toilette, it unfortunately does not last really long and needs to be reapplied, which is fair enough since it's EDT. 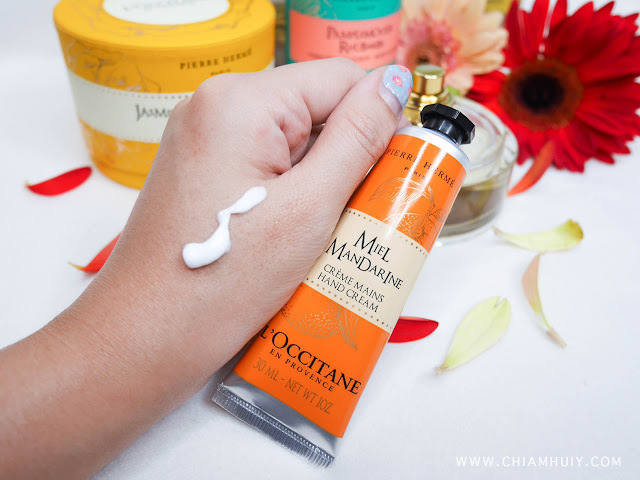 For those who prefers a sweet fruity and floral reminder of Mandarin Orange, accompanied with Honey and Immortelle, make sure you check out the Miel Mandarine hand cream and lip balm! It's a very lovely blend of floral and mandarin orange, which smells a little bit like orange gummies to me. Sweet and a little bit tangy! I didn't know grapefruit body care products can smell so great until I chance upon this Pamplemousse Rhubarbe Silky Body Lotion. It has Grapefruit at the heart of this creation, making sure all the 6 products under this creation is fresh and sweet at the same time, giving you the fruity sensation during application. I've also been actively using this because everytime I apply the body lotion, I smell great! (hahahah). It applied really well and it doesn't feel too greasy at all. It just gets absorbed rather quickly.